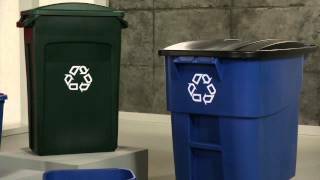 An easy and effective way to recycle paper waste and recyclable garbage, blue Rubbermaid recycling containers are the perfect addition to any environment where recycling is a priority. Rubbermaid recycling containers are a sure way to make a positive environmental impact at home and at the office. These Rubbermaid 2957-73 containers are made from post consumer recycled resins, exceeding EPA guidelines. Constructed of high-quality plastic, these recycling containers are strong, durable, long lasting and resistant to leaks, rust and dents. When placed beside traditional wastebaskets, this container will conveniently and efficiently keep recyclables separated from other garbage. The Rubbermaid Deskside Recycling Container holds 41-1/4 quarts of material to keep your environment and the planet healthy. Stock up today and keep these recycle containers all over your home and office. Dimensions: 15-1/4"L x 11"W x 19.9"H, 41-1/4 quart capacity. Well made and does the job.